Last month, NYC Audubon presented a poster at the New York Birders Conference, summarizing 16 years’ worth of Project Safe Flight bird collision data. In total, between 1997 and the spring of 2013, volunteers collected over 6,000 birds of 126 different species. 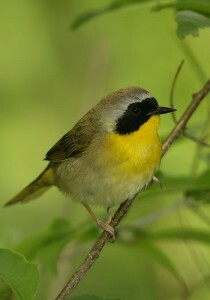 The top two species, the white-throated sparrow and common yellowthroat, make up 23% of all collisions. The ten species with the highest number of collisions were consistent across the years, and migratory birds made up the vast majority of collisions. As expected, the fall migration had a higher average number of collisions than spring, most likely due to the addition of “young of the year” birds to the population. We also examined the location of the majority of bird collisions and presented successful mitigation projects such as the retrofit of the Morgan Processing and Distribution Center and the Javits Center. Also described in the poster are the results of a persistence study that investigated the likelihood of a collision victim being found by a Project Safe Flight monitor. Because birds may be picked up by scavengers or cleaned up by maintenance staff and street sweepers, it is important to have an estimate of how many collision victims are never even recorded. We discovered that two-thirds of birds are never found, meaning that we may have severely underestimated the number of birds killed by collisions each year. The results of these analyses provided insights into bird collisions that will guide Project Safe Flight monitoring and other projects into the future. To view the entire poster in PDF form, click here.